Have you ever wondered why your child acts up? Is it because they really want to annoy you or because they’re trying to tell you something? 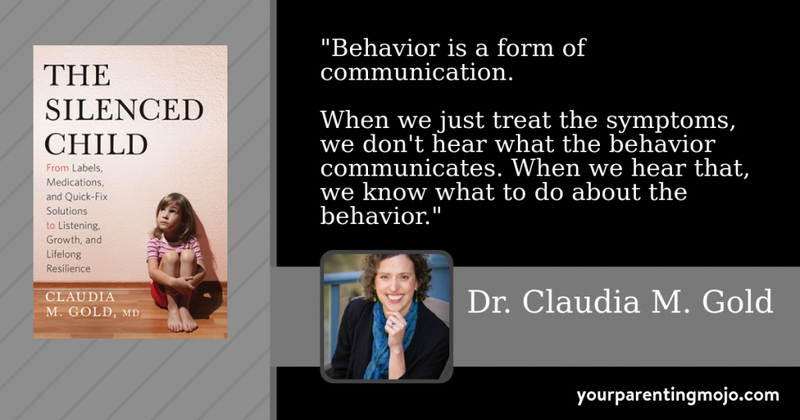 In this conversation Dr. Claudia Gold helps us to understand that what we call ADHD – an extreme example of a child’s “acting up” – is not a known biological process but rather a collection of behaviors that often go together. We might call them “symptoms,” but they aren’t symptoms in the way that a cough is a symptom of pneumonia. Instead, Dr. Gold argues that by medicating the symptoms (i.e. the “difficult behavior”) we ignore the underlying problems that are causing them which ultimately doesn’t help the child – or the family. Whether your child has been diagnosed with ADHD, whether you suspect it, or whether you’re struggling with run-of-the-mill behavior problems, Dr. Gold has practical advice to help you. Gold, C.M. (2016). The silenced child: From labels, medications, and quick-fix solutions to listening, growth, and lifelong resilience. Boston, MA: Da Capo Press. Jen: 00:30 Hello and welcome to the Your Parenting Mojo podcast. In today’s episode, we’re going to learn a lot about the science of what’s going on behind a child’s difficult behavior, including the behavior that is often described as a symptom of ADHD. I’d like to extend a warm welcome to my guest, Dr. Claudia Gold MD. Dr. Gold is a pediatrician and writer with a longstanding interest in addressing children’s mental health care in a preventive model. She’s practiced general and behavioral pediatrics for 25 years and currently specializes in early childhood mental health. Dr Gold’s latest book is The Silenced Child: From Labels, Medications, and Quick Fix Solutions to Listening, Growth, and Life-Long Resilience. Welcome Dr. Gold. Thank you so much for joining us. Dr. Gold: 01:11 Thank you for having me. Jen: 01:12 So you spent a while running an ADHD practice earlier in your career, right? Dr. Gold: 01:17 Well, as part of a general pediatrics practice, yes. Jen: 01:20 Okay. I wonder if you could tell us a little bit about that experience and how it contributed to your feeling the need to write this book? Dr. Gold: 01:27 Well, um, I think it was because there were the visits allotted were generally 30 minutes long. Kids came in not with a plan to just listen to them but rather for what was termed in ADHD evaluation. So it was almost like we had decided what was the problem before we even spoke to them and it was, I found that it was really not sufficient time to understand what was going on in the family and then the kind of standard of care for treatment of ADHD is to see kids every three months and to just have them have their medication refilled. And again, it was not nearly enough time to really understand all the complexities in their lives. So then when I practiced behavioral pediatrics so that I was able to have appointments that were longer and I would sit with these families and, and listen in more depth, I would really come to appreciate all of the factors that were impacting on the child’s behavior and able to have a much broader view than the opportunities given me by the kind of standard of care in pediatrics. Jen: 02:39 And what might some of those factors be that could influence behavior that’s like ADHD? Dr. Gold: 02:44 Oh, well there are, for example, um, I had one family where, uh, there was significant amount of a substance abuse in the family that was untreated and unaddressed, one child who actually had experienced the death of a parent and was being raised by a step parent with things that had never been addressed or acknowledged stresses on kids, that people just felt didn’t really impact on kids that were young. Which of course we know is not the case. So I think so there were, you know, dramatic things like that. Other things that I began that I, in the course of my practice, I began to have a great respect for, um, challenges of sensory processing, not to say that kids have a sensory processing disorder per se because I don’t really like to think in terms of disorder, but I really have gained an appreciation of how a kid’s sensory experience of the world is very intimately intertwined with the way their emotional experience and a lot of kids who have the ADHD label based on just sort of a basic checklist have for much of their lives, had challenges in this area that have not been addressed. So those are a couple of the things that I was able to uncover. Jen: 04:12 It seems as though the traditional approach to ADHD like a lot of other childhood behavioral problems is really to just focus on the behavior and if you fix the behavior, you’ve fixed the problem. Can you tell us how you think differently from that; what do you think difficult behavior really is? Dr. Gold: 04:28 Well, I think again, what the science shows us is that behavior is a form of communication and babies actually, even from birth have the ability to communicate with us through their behavior. So and when we look at the meaning of their behavior, again, in my first book, I talk a lot about the decades of research showing us that when, when the people who care for children are curious about the meaning of behavior, then we help them to develop the ability to think about their own feelings, to have better capacity for emotional regulation, to have better social skills, to have better thinking skills and really develop the capacity for resilience. So to kind of be concrete about it. I would have a family come in and say, well, we can’t get our child ready to go out the door. And so he’s very disorganized and loses things and all those very typical ADHD symptoms so that, uh, if we. Yeah, and you know, it’s true that the medications for ADHD are very effective at getting, eliminating me symptoms at least in the short term. but then when you dig a little deeper, you find, for example, a kid is very disorganized, is extremely anxious and so they are so focused on, let’s say, whether or not their parent is going to pick them up because a lot of kids who experienced a lot of anxiety or have separation anxiety. So let’s say that kid is worried the entire day and spending all of their energy worrying about whether or not their parent is going to pick them up so they don’t have the ability to spend the time to put the right piece of paper in the right folder so that underlying their disorganization is some significant issue in relationships. And so when we just treat the symptom, that’s just one of a gazillion examples I could give you. We just treat the symptom. We don’t get to hear what the child’s behavior is communicating and it’s when we hear that, what it’s communicating that we know what to do about it. Jen: 06:42 And it seems to me as the central thesis of the book, is that our healthcare system is really geared towards this treating of the symptoms. And if you’ll indulge me, I just want to read a paragraph from the book you say, “I recently had the opportunity to teach a seminar and infant mental health to the child psychiatry fellows at a major teaching hospital of just spending an hour giving an overview of contemporary research on infant mental health. I presented a case of a seven year old boy with a very complex family and developmental history. I then turned to the group and the how they would make sense of his behavior. A fellow responded without pause, ‘I would see if he met the DSM, the diagnostic and statistical manual I think it is, criteria for a mood disorder, and then consider prescribing an SSRI. A similarly complex case was met by this question from the head of psychiatry: ‘Do the parents need parent training or does the child have ADHD and need medication? '” And it almost seems as though the medical professionals in the system that we’ve set up for ourselves don’t have any time or energy or something to understand these underlying symptoms. And instead, the treat that behavior is, is the first thing that that happens. Dr. Gold: 07:52 Right. I mean, I think time is certainly lacking. I also think that a basic understanding is lacking because, and a language to talk about this because in child psychiatry training, there’s really minimal to no discussion of development and relationships. I know that sounds shocking. It’s very much based on diagnosis, and treatment often with medication so that there’s no language, there’s no way to think about, well, how do we make sense of what happened to this person in their infancy and how that connects with who they are today at the age of seven, and that’s what we need in order to really understand what’s going on for a kid, how kids develop the ability to regulate their attention, to regulate their emotions, to regulate their behaviors. And then once we understand that, then we know again, what kinds of things to do to help. But the psychiatrists don’t even have a way to ask about that or to think it. And that’s why they ended up with a very limited toolbox, which is just to look at the behavior and then eliminate the behavior. Jen: 09:04 Yeah, I’ve been doing a lot of thinking lately about how we transition from childhood to adulthood and how we treat adults and how we treat child children and how those two are different than you and I tend to think we have something going on between our ears. We agree and acknowledge that we have feelings and that sometimes it’s nice to have someone listen to these feelings and acknowledge them and also that those feelings impact our behavior. But it seems as though a lot of people feel as though children don’t and that all that matters is their behavior. And I guess I’m curious as to your thoughts as to when we make that shift, to the child is a person who, who has feelings that really impact what their behavior is as they get older. And whereas in the beginning it was just the child has behavior. How does that shift occur, do you think? Dr. Gold: 09:55 That’s a great question. I mean, it really should occur when the baby is born. Dr. Gold: 10:03 Yeah. I mean, I, and that’s what, and in fact, the work I do is with something called a newborn behavioral observation system where we go in and work with parents and babies from birth because of baby, even a very young baby can communicate. For example, I was talking about the sensory issues. A baby who is born with a particular intense response to touch, let’s say for example, not that there’s anything wrong with them, but that baby may cry and cry and cry when they’re swaddled and then when you put them down, they stop crying. So that’s how they’re communicating through their behavior. And they have tremendous capacity to do that from very early on, but we just need to be paying attention to it and take the time to listen to what their behavior is communicating. And it takes what it means to listen to a child takes different forms at different ages. Dr. Gold: 10:58 So for example, with toddlers, a toddler with out of control behavior may may seem like he’s trying to make your life miserable, but what he actually made me communicating is that he feels out of control and he’s looking for you to help him to set limits to, to contain his big angry feelings. So depending on where the child is developmentally, the way they communicate is different. But the idea is the same that when we take the time to listen to what the behavior is communicating, then we help them to get through it in a way that’s much more effective than if we just put kids in time out, for example. Jen: 11:41 Yeah. I actually just yesterday interviewed Julie King, who is the coauthor of a new book, How to Talk so Little Kids Will Listen based on How to Talk so Kids Will Listen, and Listen so Kids Will Talk. They are producing a new edition for the two to seven crowd. Um, and so that, that interview will be on hold until the book is released in January and yours will probably go out before this. But I think that what you’re saying is very much in line with what she is saying, which is that that behavior isn’t just, what you said is it’s not just a way to annoy you or something, that children do to drive you crazy as a parent that it is designed to communicate something or maybe even not designed. It’s, it just does communicate something. Um, if we can pay attention to that, you know, may, maybe we can respond better in the moment, but even if we can’t, as a parent of a young child, I understand that sometimes it’s really hard to take that step back in the moment, but maybe after the fact, what could we do to, if we see something that’s gone wrong, what could we do to try and make it go better next time? Dr. Gold: 12:51 Right. And I think that’s an incredibly important point to highlight, which is that often we don’t know, can’t do the right thing. We don’t do the right thing. And that’s fine. In fact, kids develop in a healthy way when just that process is that things go wrong and we go back and say, wow, that didn’t work out well. So let’s say, you know, the sort of typical scenario of being in the grocery store where your kid is grabbing at, everything and you’re embarrassed and you know, and it’s just a totally impossible thing and you lose your cool because you feel kind of humiliated and you scream at your kid and finally you just leave. And then either you yourself reflect. And if it’s a child who’s old enough to have a conversation about it, you can say, well that didn’t Go well and you can reflect on the fact that maybe the child was overtired and, and you are overtired and perhaps it would have been better to recognize that ahead of time and not go to the store at that time. But you know, you got through it. It was a bad moment. You learn from it and you move on. Jen: 13:53 Yeah. Yeah. And it seems as though I’ve heard from other sources that, that that acknowledgement process within yourself. But also with the child, if they’re old enough to understand is really a critical process, right? Dr. Gold: 14:06 Exactly. And it’s, you know, the inevitably life is full of disruptions like that, so you don’t want everything to always be perfect, but you want your child to see that things can fall apart and you can then get back together and repair what happened. So, and that’s how kids, that’s really how kids develop resilience is when things go wrong, you see that they went wrong and you move through and past them. Jen: 14:31 Hm. An interesting point. Resilience is one of my next topics that I’m going to be researching for this podcast. So it’s something that I’m starting to dig into right now. I’m curious, you sort of alluded to it right there with your example in the shopping center when it seems like one of your key thesis in the book is that behavior isn’t something the child produces. And we’ve talked a little bit about how behavior can be a signal of what’s going on with the child. But behavior can also be a signal of what’s going on with the child’s relationship with their parents. Is that right? Or even the parents’ relationship with each other. Dr. Gold: 15:09 Yeah, it’s definitely a communication about, yes, it can be a communication of distressed at what’s going on in relationships in general, both with the parent and in the environment. So for example, kids are extremely…we know now that even from infancy, kids are very sensitive to the experience of conflict between their parents and so their distress at that may be communicated through or if a parent is depressed, you know, they may act out and try to call attention to themselves as a way of either distracting the parent from their depression or distracting the parents from being in conflict with each other. And that’s not like purposeful. It’s not like a two year old has thinks this through a level of higher cognition, but they see that when they are difficult than their parents are paying attention to them and not fighting with each other. So that certainly speaks to what you said about it. Has, it, has meaning in relationship. Jen: 16:23 What can parents do about that? Then, you know, maybe maybe I’m in a relationship that can’t be salvaged. Maybe it’s moving towards divorce. Maybe you know, I’m already separated and there is a really difficult situation going on and I am having a hard time coping with it. I’m doing the best that I can, but maybe my son or daughter is acting out as it were, is expressing that behavior. What can I as a parent do about that? Dr. Gold: 16:49 Yeah. Well, the most important thing is just to recognize that because, I mean certainly as I said earlier, you know, there are inevitable stresses in life and you can’t protect your child from everything, but the damage comes when you try to pretend that the fact that you and your spouse are screaming each other in the next room and it’s not affecting your child and then then the child. So, so if you have that situation where you don’t acknowledge that it’s impacting the child and instead you get give the child the impression that their behavior means there’s something wrong with them, that’s a problem. But if you can say yes, people are, you’re going to have a hard time because of this, this is stressful. You’re going to have a hard time paying attention. You may be more disorganized, you may be angry that these are all normal responses to what’s unfortunately, going on in our family, you know, then kids feel understood. So bad things are gonna happen to people. But as long as you help a kid feel that you understand what their experiences, that’s really the main thing you need to do and that will help them to get through whatever difficult situation you’re in. Jen: 18:02 It reminds me of the idea of holding space and I don’t know if you saw that blog post that a woman named Heather Plett put out in 2015, I think it was. Um, and it, it really went viral. It made the rounds on Facebook at least. And she describes a pilot palliative care nurse who held space for her and her siblings as their mother was dying and she wrote about that concept of holding space: “What does it mean to hold space for somebody else? It means that we’re willing to walk alongside another person in whatever journey they’re on without judging them, making them feel inadequate, trying to fix them or trying to impact the outcome when we hold space for other people. We open our hearts offering unconditional support and let go of judgment and control.” And it seems to me as though you offer that kind of holding space for your clients. Can you tell us about how that process works and how you think it helps them? Dr. Gold: 18:50 Yeah, it’s interesting because I use the term, the holding environment where actually actually comes from Winnicott who was a pediatrician and psychoanalysts and the idea of the holding environment. Certainly a lot of the things that you touch on, but there are some parts of it are more specific to parenting, which is, well certainly the nonjudgmental presence. Um, but this safety…you know, it’s not physically holding, but it’s helping to tolerate and be with big and difficult feelings without making them go away. But just to talk, to allow a person to have big and difficult feelings without imposing judgment and without doing things like, well, it’s going to be okay and everything’s fine. So it does have a lot in common with what you just described, but that’s where the idea comes from. Jen: 19:50 How does it help? Dr. Gold: 19:51 How does having a holding environment help? Jen: 19:57 Yeah: what does it do for a person to be in that environment? Dr. Gold: 19:59 Well, if you think back to where the original place where it’s with a parent and an infant, it really is how a baby develops a sense of who they are because the person who is present with them and reflects their feelings back, but yet in a way that helps them to feel like they can manage their feelings. So it really is such an incredibly fundamental process to a baby. Jen: 20:30 Can you give us an example of that? I’m just struggling to picture exactly what you mean. Dr. Gold: 20:32 Um, yeah. Well sort of the everyday distress…just the everyday experience of having your diaper change, you know, it changing a baby’s diaper. Then you have this wet cold thing, you have to hold them down but you’re talking them with a soothing voice. You’re doing something that’s necessary but unpleasant, but you’re talking them through it and you’re giving them a sort of bodily sense that you get what they’re feeling but you and you get that they’re upset but you are going to help them to get through it and then you finish and then you hold them and comfort them. So if you’re, you sort of….the physical holding and also the emotional holding. I mean actually I have another example of that in my first book of when a baby cries during the night and there’s nothing really particularly wrong with them, but they just need to be held. Dr. Gold: 21:30 And so, you know, I’m a mom might be incredibly tired in the middle of the night and feel like, oh I can’t do this. I’m a failure. And they have to kind of manage those feelings and also recognize that there’s nothing wrong with their baby, they just need to cry. And so you sit with them and you hold them and you transition them from that state to a more calm state of sleep. So that’s in the baby. Now an example of a holding environment…Winnicott also talked about it in sort of more similar to what you described, which is in a clinical setting. So in the clinical setting, the kind of offering a holding environment. Well it’s first of all just the safety of the space, you know, the time; an expanse of time so that it’s not rushed, that it’s comfortable that, that, you know, it’s soundproof so you don’t hear people on the other side of the room. Dr. Gold: 22:22 So we’re just attending to the physical space to bringing your full self as the clinician to be present with the parent in this situation, because I work with parents and children.. So the holding environment is not so much what you say in the encounter, but the way you are a present with the person, with your full emotional presence in a safe, comfortable environment and that you feel comfortable that they get angry or sad or cry or big feelings are okay and you will stay with them. I mean this is a parallel thing for a parent with a child to a therapist with the parents that you can tolerate big feelings and hang in there with them as they move through difficult feelings to the other side where they calm down. Jen: 23:11 Yeah. That’s an incredibly helpful thing for me to understand as a parent, to know that if I create this safe space, a safe environment for my daughter to experience, whatever feelings she needs to experience and, and to try and send her the message that that’s okay, and that may include include crying and tantrums and who knows what that may be very uncomfortable. And maybe, you know, maybe if the tension appears in a public place, and I feel like a bad parent for, for having a who has tantrums, but the ultimately that that can be a very powerful thing for our relationship in a positive way. Am I getting the right thing out of that? Dr. Gold: 23:55 Yes, exactly. And so, you know, a tantrum is a perfect example. It feels terrible to everybody involved in the moment, but if you, if you are okay with the fact that your kid can get those screaming mad and you don’t freak out about it, I mean, that doesn’t mean you don’t set limits. Again, you may even have precipitated the tantrum by saying that they can have a donut and that’s okay too, but that you still love them and you’ll be with them and so they’ll have their thing and they’ll have to make sure that they don’t hurt anybody and that they don’t hurt themselves, you know, so they can’t throw things. It can’t slam doors, but they can get mad as heck. And, and, and you will just be there and that’s okay because I just, the image came to mind of sometimes in my office I will see kids who have just had a sibling, and they’ll take like a baby doll and they’ll like whack it against the floor and often parents are so freaked out about that. Jen: 25:01 I think I would be! Dr. Gold: 25:05 But, but that’s an example, obviously that can’t hurt their actual siblings, but having feelings of aggression towards a new sibling are very normal and healthy. So, so finding a way to allow your childhood expressed those without, and that you, you get it, you get the kids have big feelings and those feelings are okay. The behavior is not okay. But the feelings are okay. Jen: 25:30 Yeah. I actually, I wonder if we could dig into that a little bit more just because it is such a common question that I see; we have a new brother or sister in the house. The toddler is um, you know, I guess expressing big feelings would be a nice way and maybe has said, I want to give the baby back. I wish the baby wasn’t here anymore, um, or every time they’re near the baby, they’re really rough with the baby. What can parents do and that kind of situation. What are some real concrete things that parents can do to support their toddler through that stage? Dr. Gold: 26:04 Well, the first thing is to make this distinction between feelings and behavior so that the behavior is absolutely not okay and kids feel better even though they give you a hard time when you control their aggression so that they feel like they want to hurt the baby, but you will never let them hurt the baby. So that’s number one that you have, that you control their behavior. Jen: 26:28 When you say sorry to interrupt, when you say you control their behavior, you just mean you will never give them the opportunity to hurt the baby or how does that control work? Dr. Gold: 26:36 However you’re going to do that. You are very clear about that. But at the same time, giving them a way to express their frustration and anger. So and acknowledging that these are okay feelings to have. And so maybe if there, and also again the communication, maybe it’s a child who’s really missing their parent and needs 10 minutes of special time with that parent once a day where they get kind of undivided attention as realistic as possible so that, you know, because parents get very upset with the toddlers and the older kids when they heard the baby; setting limits on the behavior but being in a kind way so that they understand that it’s communicating in a kind of a need for connection with you as the parent and then providing them with that. So that’s an example of sort of interpreting the meaning of the behavior. It’s not that they hate their sibling is that they want you. So if you respond to that communication rather than the hitting that that’s an effective way to get past it. Jen: 27:43 Okay. Thanks for that. And so we’ve spent a while talking now about what I guess is how “normal” relationships develop. I wonder if we get looped back into adhd and um, and thinking about medication, um, because some, some kids have apparently been helped by using ADHD medication and I hear parents say he’s, he’s taking it now. He’s able to focus on his schoolwork and he’s not disrupting the class anymore. And I’m curious as to whether you think there’s ever a place for medication in treating behaviors that have been labeled as being caused by “ADHD”? Dr. Gold: 28:24 Uh, yes. I think we have to function within the world as it is. Our education system is quite rigid now. Kids are required to sit in their desks all day. Teachers are under enormous pressure to have meet standards and have set curricula. So, so in the ideal world, we would be able to have a more individualized approach to kids who have difficulty with regulation of behavior and attention and emotion. So for example, if we had a kid who had challenges with sensory processing, often those kids benefit, let’s say from music, so if a kid could have music every between every class for five minutes, they might, that might be more effective treatment than medication, but the school doesn’t work that way. So within the confines of the current structure, in order for kids to learn, absolutely medication is very effective in the short term, there is no doubt about that, that a kid who has difficulty paying attention and is disorganized and distracted, that almost within a few days or even a day of starting on a medication, they’re better. So the problem comes in when that’s all we do and we don’t also think creatively about what those child’s unique qualities are, you know, using the example of the sensory processing. Um, but also we don’t attend to what’s going on in the child’s life. So if we can do both of those things while the kid is on medication, then it’s okay. But I don’t ever think is okay, is just to prescribe medication and then just go on autopilot and just refill the medication or if the kid’s grades go down, change into a different medication or if they start having behavior problems in the evening to a long acting medication. And this is unfortunately what happens. It becomes the entire treatment of a child for years is all about what is the medication, how do we adjust the medication? And that’s when kids really get into trouble because first of all, they become responsible for everything that’s going on in the family. It’s all on them and inevitably things are going on, but we’re just not asking about that. So I think as long as we don’t do that, it can be okay sometimes. Jen: 31:08 So by being responsible for what’s going on in the family, if I’m understanding you correctly, what I’m hearing you say is that there is something going on in the family that, that child is expressing their feelings about through their behavior, and that we are moderating that behavior because that’s the part that is annoying to us or is not helping the child to function when actually we should be dealing with what is the cause of that behavior? Dr. Gold: 31:32 Yeah. Well we should be attending to the totality of the child’s experience. Any child will experience things in life and some of them are more challenging than others. So for example, I had a kid who was diagnosed with ADHD and in, in like the typical fashion was treated in this way; going to the pediatrician’s, adjusting the medication based on her behavior. And then, five years or even longer than that, it was about eight years into this kind of treatment. It emerged that the father was abused, there was significant domestic violence and there was actually a call to the police, but nobody knew about that because we were so focused on the kids’ behavior, we didn’t just say, hey, how are you? What’s going on at home? Is everything okay? Because it’s just, you know, and people don’t tell you those things unless this sort of gets back to the holding environment. For that mom to tell a clinician what was actually going on in her home would require a lot more than the 30 minute visit about her kids medication because she would need to feel safe enough to tell the clinician she would need to feel that it was a trusting relationship. Dr. Gold: 32:57 She would need to feel safe enough to even think herself about how that might be affecting your child. So that’s, that’s really what. And that’s just one of many examples I could think of. Jen: 33:10 Yeah, that’s pretty shocking example. Dr. Gold: 33:13 But suffice to say that the behavior, you know, we get into trouble when we say what was the behavior causing the ADHD. That’s not really what I’m saying. What I’m saying is that we are not listening to what’s going on for the child when we focus exclusively on treating their ADHD. Jen: 33:31 So I wonder if as we wrap up, we could think about how my listeners could actually kind of put this information to good use for themselves or maybe some of them wonder if their child might have ADHD, maybe they’ve already been “diagnosed.” what would be your suggestion for how those parents can move forward? Dr. Gold: 33:51 Well I think the, you know, I sort of go back to Dr. Spock: “trust yourself.” Because I think we tend to be…parents tend to be sort of overrun by experts. I mean here I am, speaking as an expert… but parents should trust their intuition about their child and just make sure that the totality of their child is being addressed rather than just this one specific thing. And if that can be hard. It can be hard to look at the all the issues. But um, and it can. And often if you know the system, the school system, the healthcare system doesn’t really offer that kind of space. Um, so it may fall on the parent to advocate for their child to say, well, okay, this is fine, but we need to really look at it all the things that will help our child to do well and not just a diagnosing with ADHD and medicating him. And also I think, to take care of yourself because I think when parents themselves are so busy and running and don’t have any time to think, I’m then thinking about a child is really hard. So having a social community, connections for yourself as a parent, things that make you feel calm, whatever they’d be walking, exercise, painting, I don’t know, something, something to help with your own self-regulation because that makes you more able to be, to think about your child in this broader way. Jen: 35:34 Yeah. Thank you so much for the advice that you’ve given us today. I think it’s been useful not only for people who have a specific interest in ADHD and, and want to hear a bit more about that, but also just for parents of “normal” children, who may be able to put this information to really good use and, and, and perhaps provide that holding space, holding environment for their child and maybe even cultivate one for themselves. Dr. Gold: 36:02 Yeah. Great.